ASU prof studies similarities in land stewardship around the globe. What's the same in Nepal and Arizona? Land stewards caring for livestock. Abby York grew up in Wisconsin, on land where her family has operated a dairy farm since the 1800s. As a kid, community was synonymous with family, and this had a critical impact on her worldview. York didn’t know it at the time, but being surrounded by people who valued place, community, land and livelihood was the ideal training ground for her future career as an environmental social scientist. “In retrospect, my entire academic career has been shaped by a preoccupation with the land and how local communities collectively manage it,” said the School of Human Evolution and Social ChangeThe School of Human Evolution and Social Change is the College of Liberal Arts and Sciences. associate professor. Whether in places like Nepal or here in Arizona, YorkAbby York is also director of the environmental social science graduate program. explores how communities and institutions have provided goods like water, agriculture and natural resources throughout history and in modern times, working with both natural and social scientists from a variety of disciplines in order to gain a broader, more informed perspective on these issues. “Typically, when I get a chance to talk with someone who works the land, I feel at home finding common ground whether in Arizona or halfway around the world,” said York, pictured at left. One of York’s current projects involves community forestry governance, or how local people manage the surrounding forest and its resources, in Chitwan, Nepal. Specifically, the project examines communities’ ability to deal with Mikania micrantha, an invasive plant species. Closer to home, York studies the vulnerability of Arizona’s agriculture and farmers to climate change, as well as the effects of urbanization in Arizona, which she examines alongside the Central Arizona Phoenix Long-Term Ecological Research program. York has found both similarities and differences in Nepal and Arizona communities’ natural resource governance. In Nepal, households are shifting from subsistence to industrial agriculture, or they are seeking opportunities away from the farm and migrating to other parts of Asia. In her study area of Chitwan, most households are still involved in farming, at least for household use. In Arizona, the number of independent farmers who work their own land is growing smaller. Most agriculture is intensive and done through large, family-owned corporations. The two groups share some similar concerns when it comes to wildlife governance. Jaguars are found in southern Arizona, wolves to the east, and mountain lions throughout the state, which create worry over livestock loss and human-wildlife conflict. Likewise, the tiger and rhino populations of Chitwan cause significant losses of livestock and even human life. “In both places, there are sometimes tense conversations about what costs should be borne by individuals and households to preserve these important species and how society compensates communities that live with these risks,” York said. There is a marked distinction, however, between the two communities’ attitude toward the land, she said. Another difference between the two regions is how they are affected by climate change. In Nepal, changing weather patterns are leading to an increased risk of flooding. Many communities are near major rivers that flow from the Himalayas, and with heavier rains suffer loss of human life and major damage to infrastructure. This alters the timing of irrigation and agricultural practices in this farming region, as well as the abundance of forest resources. Arizona is experiencing the opposite problem — an extended drought and shifting rainfall patterns. The impact on agricultural communities has been minimized by Arizona’s extensive irrigation systems and water policies, but there are predictions that within the next 20 years, this buffer will be gone due to reduced access to water from the Colorado River. Ranching communities are already seeing some negative effects of climate change in the quality of the grasslands. The most crucial ingredient to these communities’ success is one that they have in common: in both places, there are strong efforts to collectively organize the provision of public goods to rural communities. In southern Arizona, ranchers have collaborated with environmentalists to conserve wildlife, open spaces and opportunities for ranching. In Nepal, communities have come together to gain legal access to the forest, manage its resources and petition the government for compensation due to wildlife conflict or natural disaster. This March 11 Arizona State University engineering students will be headed to San Diego for spring break. While that doesn’t sound unusual this time of year, they’re not only going for fun. Solar Spring Break gives low-income families access to renewable energy and its cost-saving benefits when they otherwise wouldn’t be able to afford or access it. Participating students get a first-hand experience in the fast-growing solar energy industry. The SEEC program is participating for the second year. Beginning on March 7 — spring break runs from March 6-13 — they’ll spend two days in training learning how to install a solar system. The following two days they’ll install the system on one family’s house in the San Pasqual Indian Reservation outside of San Diego with equipment provided by GRID Alternatives. 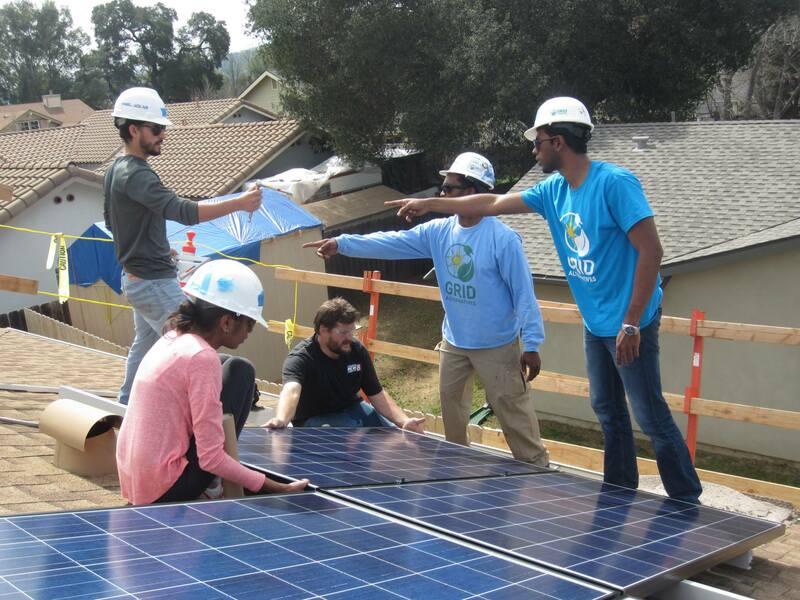 SEEC graduate student Nicholas Fortenberry, who attended last year’s program in Atascadero, California, found the whole process of installing a solar system to be informative. At the end of the week they’ll check the system, clean up and unveil it to the family. The big draw of Solar Spring Break, which has spread by word of mouth to the 2016 students, is the rewarding experience of seeing the family’s electric meter roll back after the solar system is turned on. Along with experiencing the small-scale, single-house solar system installation, PSM SEEC program manager Karen Dada set up a trip to check out a solar farm on their way to San Diego. Last year’s group went to the Topaz Solar Farm, one of the world’s largest solar farms, in the Carissa Plains in Central California and got to talk with their engineers. The overall experience will be very educational for the PSM SEEC students, who study solar energy engineering, energy policy and project financing — an “MBA meets solar engineering” program as Jasinski describes it — in a program that can be completed in 12 months. And this isn’t the first time the students have traveled together. The PSM SEEC program includes a week-long energy policy seminar in Washington, D.C., to network with solar industry professionals. It’s still important to unwind and recharge for the rest of the semester, so it won’t be all work and no play for the SEEC students. They’ll take a couple extra days to soak up at the beach, check out the sights in San Diego and let loose before they hit the books again on March 14. Interested in applying for the Professional Science Master’s Solar Energy Engineering and Commercialization program? Applications are now being accepted for fall 2016 enrollment. Visit engineering.asu.edu/solar or contact Karen Dada (kdada@asu.edu) for more information.